Evergreen azaleas (Rhododendron spp.) comprise hundreds of varieties of shrubs known for their springtime flowering displays. Maryland has ample rainfall and fertile soils for growing these plants. The only limiting factor is the extent of winter cold, as the extreme high mountains in the western panhandle may not be best for retention of foliage. Elsewhere in the state the shrubs grow well since they are in U.S. Department of Agriculture Hardiness Zones 6 and 7. In 1950, the USDA in Beltsville, Maryland, began breeding evergreen azaleas that bloomed early to midspring and often had low, spreading plant growth habits. Varieties in this group survive winters no colder than zero degrees F. Names of some varieties include, Dainty Rose, Eureka, Guy Yerkes, Polar Bear, Pequeno, Pinkette, Snowdrop, Casablanca Improved and Whitedoll. Overall, Beltsville hybrid evergreen azaleas ornamentally resemble Glenn Dale hybrid azaleas. Gable hybrid evergreen azaleas are among the most cold tolerant around, as they were bred in Pennsylvania and have parentage including species Rhododendron kaempferi and Rhododendron yakushimanum. These shrubs tend to bloom heavily in midspring and are hardy to winter lows no colder than zero degrees F. In particularly cold winters, plants may be slightly deciduous. 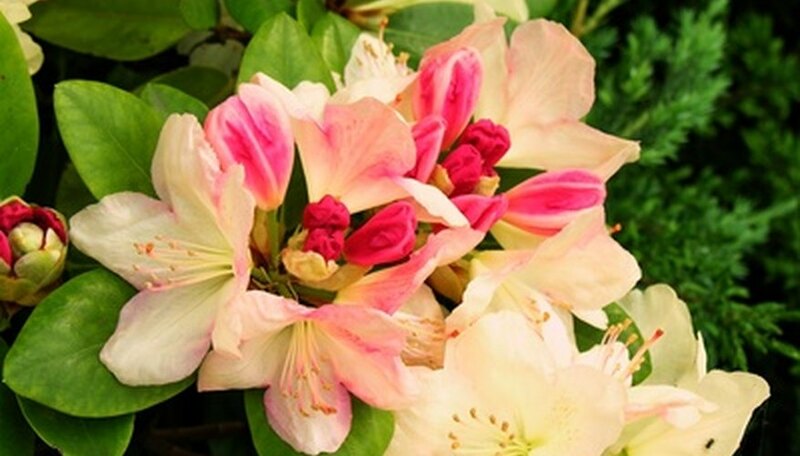 Names of some varieties of Gable hybrid azaleas are Caroline Gable, Herbert, Fashion, Louise Gable, Pioneer, Purple Splendor, Purple Splendor Compacta, Rosebud, Corsage and Rose Greeley. Developed in Louisiana, the encore azaleas are the result of crossing Southern Indica and Kurume evergreen azalea types. The primary feature of encore azaleas is their reblooming autumn after a primary flowering display in early to midspring. Because these azalea shrubs are bred from less cold-hardy parent plants, consider using them in landscapes where winter temps never drop below 5 to 10 degrees F. Encore azaleas should be grown only in extreme Eastern Maryland along the Chesapeake or on the Delmarva Peninsula protected from winter winds.